It has been a while since I marathoned a show, but this past week, I watched all that I could of the anime known as My Hero Academia. So far this anime is still in the midst of its second season, with likely more to go after it and I’m certainly interested in seeing more as it comes out. The series takes place in a near-future Earth where humans with superhuman abilities known as “Quirks” is the norm. Thus with the rise of super-villains, the job of being a government-funded “Hero” has become a real-life possibility. Our story follows a young boy named Izuku Midoriya, who is in the minority of people who are “Quirkless”. Despite this he wishes to be a Hero one day, like his favorite Hero, All Might. One day after he rushes to save his former friend and present bully, Katsuki, from a villain, he impresses All Might with his heroic actions despite having no abilities. In the end, All Might decides to bestow Izuku with his own Quirk, called “One For All”, which gets more powerful the more it is passed on to someone else. The series involves Izuku going to school to learn to control his new ability and to become a Hero. The series is an interesting take on the idea of superheroes, primarily because in this world having superpowers is a normal thing that most people have. Even our main character’s parents have Quirks. The show even points out the problem that “some people don’t know what to do with their Quirk”, which can lead to villainy. But mostly, the world that My Hero Academia inhabits is very similar to our own, where people with powers still go on with their daily lives. Not everyone has to be a Hero if they do have powers, and some people without powers, like our main character, seek to become one. Having such a large amount of people with powers allows for rather unique abilities that aren’t just your average “super speed”, “super strength”, etc. Those do exist, but many characters have very specific and strange powers, such as the ability to shoot lazers from one’s bellybutton, or producing sticky spheres from one’s head. Many abilities also have dangerous or harmful caveats to them, leading to nausea, temporary idiocy, or bleeding due to overuse to name a few. In Izuku’s case, since his powers were bestowed onto him, and he isn’t used to them yet, his own body can’t handle his Quirk. He gains a great amount of strength, even able to break down concrete with a flick of his finger, but whatever body part he enhances with his Quirk will literally break after it is used. A majority of the time that Izuku is fighting, he does so without the use of his Quirk and relies mainly on strategy, which I find much more interesting than the usual fighting-based-anime method of muscling through everything. Katsuki (left) and Izuku (right). In terms of characters and writing, I’d say the show does pretty well. The first season throws you right into the world and story, with nearly each episode ending in at least a slight cliffhanger to keep you wanting to see more. It manages to constantly change the status quo, so each episode is exciting as new information keeps coming our way. The relationship between Izuku and Katsuki is heavily explored in this season and also points to some interesting commentary on bullying, from both the bully and the victim’s perspective. The second season lags a bit since it revolves around a competition complete with the overused concept of a fighting tournament. However, it does come with a great amount of development for the side characters which we were missing in the first season. In a strange way, I ended up making some character connections in this show with characters from Avatar the Last Airbender. For instance, Izuku’s abilities are enhanced due to other people having had his power before him, and at one point he seems to have gotten help from the essence of his predecessors, much like Aang’s “Avatar State”. Then there’s the character of Shoto Todoroki, who’s personality and backstory are exceedingly similar to Zuko’s, complete with daddy issues, fire powers, and a facial scar caused by one of his parents. I don’t think that this show was attempting to copy Avatar, due to that show being practically unknown in Japan, but I find it an interesting coincidence, and shows that My Hero Academia has some similarly good character writing (not as good, but still good). My Hero Academia does suffer from some unfortunately common anime tropes. The main one being the sexualization of female characters. I know this isn’t exclusive to just Japanese cartoons, but I still find it really creepy when a show is essentially sexualizing teenagers. Some of the female superheroes wear really skimpy and form-fitting clothing, and the show puts too much time and too many “jokes” into commenting on this fact. They do try to show how the general pervy-ness of some of the male characters is bad, but they can’t just have their cake and eat it too. Another thing that I’m somewhat bothered by in My Hero Academia is its use of English phrases and American imagery. I watch most anime in the original Japanese language, since I prefer the original voice cast, and since I understand Japanese. One thing I noticed is that Japanese anime has a habit of using western languages or culture to seem “cool” while lacking a lot of understanding of those languages and culture. In My Hero Academia, we have three characters who do this – the main superhero of the series, All Might, a hero with voice-pitch enhancing powers, Present Mic, and one of Izuku’s classmates Aoyama. The former two use English a lot, and in the case of All Might, there is a heavy focus on American culture. The latter uses random amounts of French and appears to be a French stereotype. Usually, I really dislike this trope in anime, since, like most token characters, these characters tend to be flat, vaguely racist, and used mostly for comedy. In the case of the character, All Might, however, I really like him. He is a well written character, he is central to the plot, and you really can get behind his sense of justice. His American-ness, also makes total sense in this series. His Hero persona is heavily inspired by American comic books, which exist in this world, and the style he is drawn in even looks more like an American comic style rather than the anime style of most of the other characters. He is much more of an homage to American superhero comics than a stereotype of them. If more token non-Japanese characters were like this in anime, I wouldn’t have a problem with the trope. However, what bothers me about this trope in My Hero Academia is that I’m not sure if these characters are actually foreign. All of their non-superhero names are Japanese, and it is known that the characters went to school in Japan. 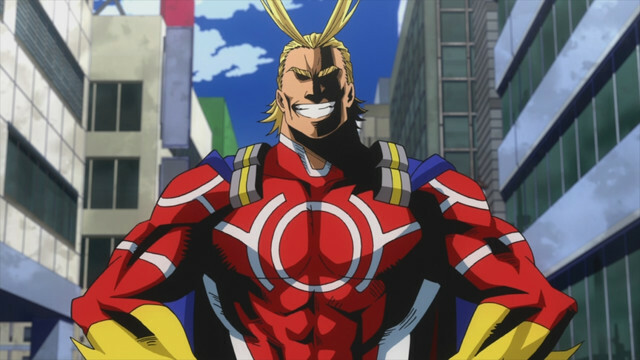 It is known that All Might has worked around the world, and has worked primarily in America, but his actual origins are unknown at this point. It is entirely possible that he or the other two characters are part Japanese, and have a more diverse ethnicity, but this is never discussed. And if these characters are purely Japanese, then this use of other cultures and languages in such a way, feels uncomfortably close to cultural appropriation. All Might, the Symbol of Peace (and of American comic book heroes). 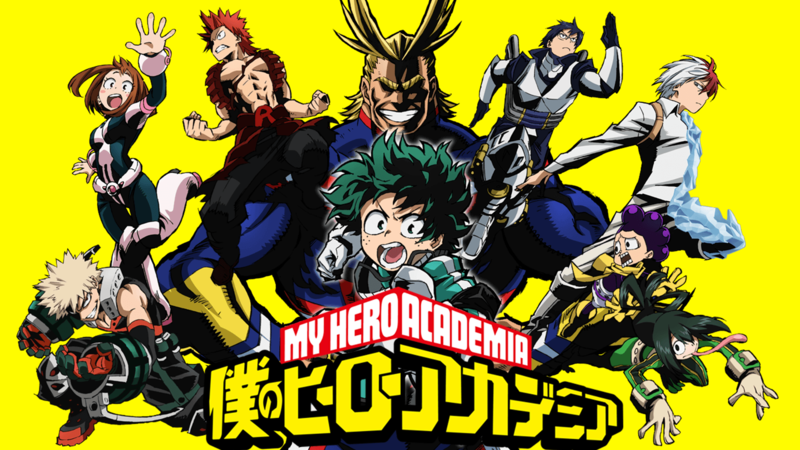 Despite suffering from a couple of over-done tropes that I dislike, My Hero Academia is a fairly solid show, with decent writing and character development, and a unique take on the superhero genre. It did manage to keep me consistently watching enough to finish its current 26 episodes in a week, making it a fun ride that I’d recommend to anyone who likes superheroes. The tournament arc can’t even be considered a trope anymore, but a necessity in a long-running-shonen-to-be like this one. And who cares anyway? The tournament was nothing but pure hype the whole way through. Well, a “trope” is defined as a significant reocurring theme, so the fact that the tournament arc appears so often in anime makes it a trope. Being a trope doesn’t always make it a bad thing. Some tropes are good or when used right, effective in story creation. Personally, I’m not a big fan of the tournament arc trope simply because I’d rather see a different or new way to introduce characters and their fighting abilities. The tournament arc trope isn’t a necessity, but I understand that it is often used to quickly introduce a lot of characters and abilities all at once. And as I said in the case of “My Hero Academia” the tournament arc was effective in introducing the side characters that we didn’t see as much of in the first season.